An annual ritual at the G-20 meetings is the group photo where leaders of 20 of the world’s biggest economies stand together to display their unity in purpose: keep the global economy steady. Like many family photos, it’s not unusual to see awkward moments and uncomfortable poses between leaders who are actually seething with acrimony. And at this year’s G-20 meeting in Buenos Aires, has one notable attendee who some will be avoiding: Saudi Arabia’s Crown Prince Mohammed Bin Salman. The cloud of doubt surrounding the role of bin Salman, also known as MBS, in the brutal killing of Saudi journalist Jamal Khashoggi in Istanbul in October continues to persist despite adamant denial by the Saudi government. Western intelligence services have reportedly heard a gruesome tape of Khashoggi being dismembered and killed at the hands of a Saudi hit squad. The CIA has concluded that MBS ordered the killing; and in the court of public opinion, MBS has been tried, convicted and earned the nickname Mr. Bone Saw. Despite that embarrassment, MBS may well see his rightful place at the front row of the G-20 portrait, where leaders of major economic powerhouses typically stand. Saudi Arabia’s recent increase of oil supply onto the international market was welcomed by Donald Trump and global economic analysts fearing an impending global economic slowdown. With a U.S.-China trade war looming, keeping oil prices depressed is generally good news for the G-20. If the summit is about keeping the global economy steady, we can expect the Saudis to take credit for keeping prices low. As MBS likely turns to his right and left, however, there will be many faces trying to avoid making eye contact with the crown prince. France’s Emmanuel Macron, Germany’s Angela Merkel, and Canada’s Justin Trudeau will want to avoid MBS like the plague. 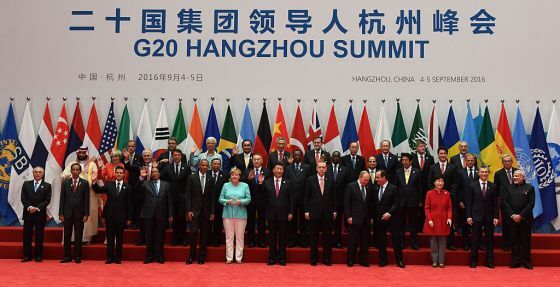 Greg Baker—AFP/Getty ImagesWorld leaders pose in Hangzhou for the 11th G20 Leaders Summit from September 4 to 5, 2016. But not all leaders will care about public perception— or even believe in the sanctity of not killing one’s citizens, especially on foreign soil. Russia’s Vladamir Putin seems to have no shortage of blood on his hands when it comes to eliminating journalists, dissidents, and former spies. Whether Russians are killed meters from the Kremlin or poisoned in sleepy Salisbury in the United Kingdom, Putin and his regime may be impressed by MBS upping the game. Perhaps there’s even street cred for Putin in posing with MBS. Another leader who is far from being shy about cracking down on dissidents and perceived rivals is Chinese President Xi. From the mass detention of Uighurs in Western China to literally kidnapping and detaining the head of Interpol, President Xi likely sympathizes with the Saudis’ need to contain critics in the name of the national interest. In good Chinese fashion, President Xi would have probably liked the Saudis to be smarter and more discrete about how to take out one of its own. After all, the former head of Interpol, Meng Hongwei, had disappeared the same week as Jamal Khashoggi and few headlines have been written about Meng. While Trump is often a wildcard at world meetings and gatherings, it would come as no surprise if he goes ahead and shakes MBS’ hand and smile for the cameras. After all, Trump has continued to contradict his own intelligence service, support MBS on twitter and in media interviews, and most importantly thanked the Saudis for their continued pumping of oil to keep Trump’s populist base from having to face high prices at the gas station. Unlike many G-20 meetings, this one in Argentina may be hard to forget. Many will look back at that infamous family portrait and say: Remember when MBS had the audacity to flash his wide grin to the cameras, as if the murder of Jamal Khashoggi never happened?